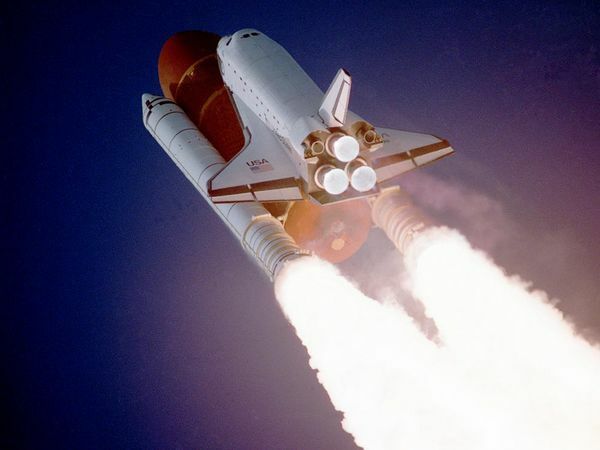 Today marked the final launch of the Space Shuttle Discovery. I admit I have mixed feelings about the shuttle program and human space flight in general. On the one hand, there is the allure of exploration, of adventure, of discovery not by proxy but personally; on the other, there is the huge extra expense, the high risks, the technical challenges that could prevent any real serious scientific exploration farther than the Moon. How much is the cost balanced by the inspiration? I know a lot of scientists who felt drawn to science as kids because of the Apollo missions or the Space Shuttles; although I don’t have hard data for this, I suspect a lot of funding for NASA’s scientific projects was available because of support for the manned program. However, scientific expeditions were pared back or canceled while the highly expensive shuttle program went on and on. To a person of my generation, the Shuttle has always been there. The Challenger disaster is one of my strongest memories of childhood: they brought us out of our classroom to the library to see the news coverage. Beyond that, there was Spacelab, the launch of the Hubble Space Telescope, and who knows how many hours I spent watching various launches and pieces of video from orbit. Despite all my objections to space flight by humans, if someone offered me a chance to go myself…well, I couldn’t say no. So I understand, and in spite of all my concerns and my strong desires that science should take precedence over what amounts to an expensive program of public outreach, I hope we can find a way to keep going into space.